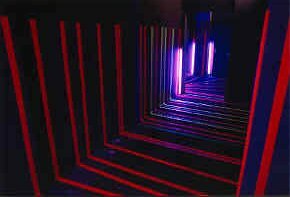 Club Transmediale is located in 2003 in the Neue Maria, which is a nightclub in Berlin. My installation is located in the long hallway towards the men’s and women’s restrooms. The hallway has three parts. It is a tunnel, which is two times changing its direction. 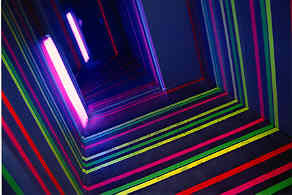 I correspond in my installation with the light of the night club and install black light. 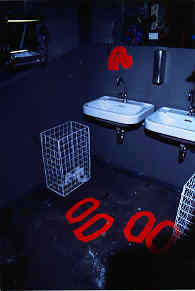 This installation / performance is my answer to a movement habit towards the restrooms. 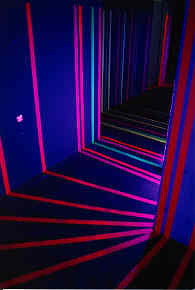 The urgent accelerating movement, the habit within a cabin and the relaxing stay before entering the main space again. 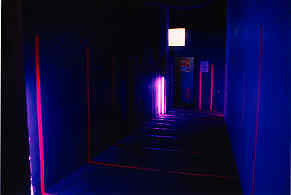 The gafferstape lines are building a man hight tunnel, which is leading in red fluorescent colors towards the entrance doors of the restrooms. Towards the doors the lines are narrowing more and more. The highest concentration is at the restrooms’ entrance. The lines are even leading into the restrooms. In a performance at the opening I mark people’s positions in the restrooms’ cabins. The hallway space in between the doors is the location, where people like to smoke, to talk and relax, before entering the main space again. 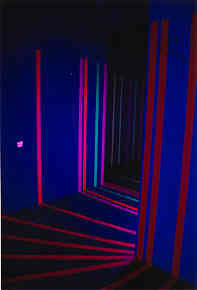 I create an friendly atmosphere with more colorful lines in pink, green and yellow tape. 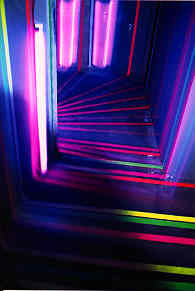 The music of the festival Transmediale remains as a stabil background sound and mixes with the light and the fluorescent canal of leading gafferstape lines.